Candace H. Johnson-For Shaw Media Sgt. Anthony Bui and Lance Cpl.Richard Stanger-Dyer thank John Bellomo, of Grayslake for his toy donation to Toys For Tots as they collect donated toys outside of the Toys“R”Us Outlet store in Gurnee Mills. Candace H. Johnson-For Shaw Media Lance Cpl. Richard Stanger-Dyer and Sgt. Anthony Bui, talk to Russell Vazquez, 5, of Crystal Lake about the toy sword he is donating to Toys For Tots outside of the Toys“R”Us Outlet store in Gurnee Mills. Russell was at Gurnee Mills with his parents, Rick and Stephanie, and sister, Alexsa, 2. Candace H. Johnson-For Shaw Media Sgt. 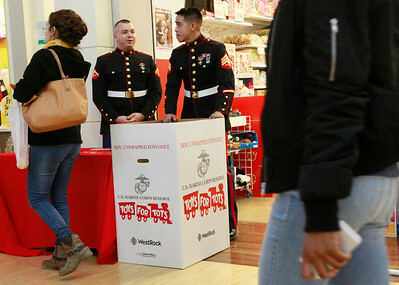 Anthony Bui talks with Marcy Harris, of Kalamazoo, Mich. as she drops toys in the Toys For Tots box outside of the Toys“R”Us Outlet store in Gurnee Mills. Candace H. Johnson-For Shaw Media Lance Cpl. Richard Stanger-Dyer and Sgt. 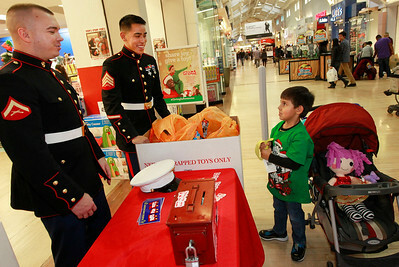 Anthony Bui collect donated toys for Toys For Tots outside of the Toys“R”Us Outlet store in Gurnee Mills. Candace H. Johnson-For Shaw Media Lance Cpl. Richard Stanger-Dyer and Sgt. 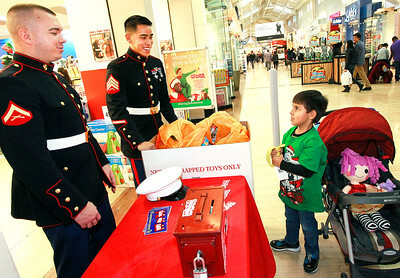 Anthony Bui, receive a Minnie Mouse stuffed animal donation for Toys For Tots from Franklin Yeh, 2, of Milwaukee, Wis., outside of the Toys“R”Us Outlet store in Gurnee Mills. Franklin was at the mall with his sister, Giana, 5, and their parents, Chris and Janelle. Candace H. Johnson-For Shaw Media Sgt. Anthony Bui and Lance Cpl. 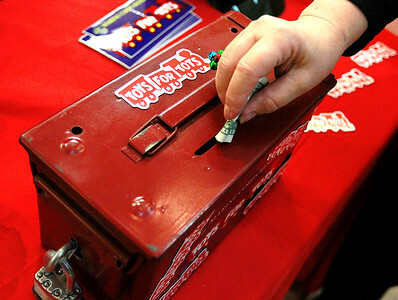 Richard Stanger-Dyer collect donated toys for Toys For Tots outside of the Toys“R”Us Outlet store in Gurnee Mills. Candace H. Johnson-For Shaw Media Lance Cpl. Richard Stanger-Dyer talks with Kaity Calhoun, of Plano as she makes a cash donation to Toys For Tots outside of the Toys“R”Us Outlet store in Gurnee Mills. 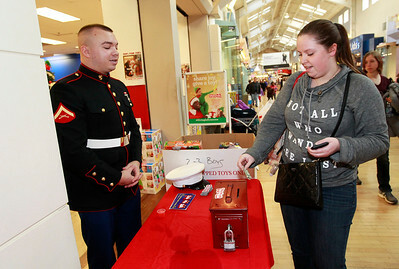 Candace H. Johnson A shopper makes a donation to Toys For Tots outside of the Toys“R”Us Outlet store in Gurnee Mills. Lance Cpl. Richard Stanger-Dyer and Sgt. 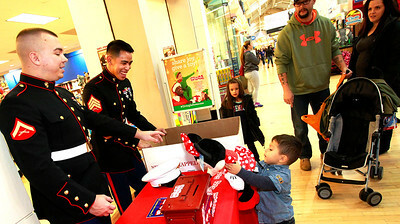 Anthony Bui, receive a Minnie Mouse stuffed animal donation for Toys For Tots from Franklin Yeh, 2, of Milwaukee, Wis., outside of the Toys“R”Us Outlet store in Gurnee Mills. Franklin was at the mall with his sister, Giana, 5, and their parents, Chris and Janelle.